The Web’s missing features for built-in user identity have become a real headache for the industry, and for its users too. It certainly took its toll on market leader Google this week as its “Identity Theater” continued (Source: Kevin Marks.) The issue? It’s turning out that making every single user comply with the Common Names policy isn’t workable for a variety of reasons. Reports of Google deleting accounts en masse are driving a lot of the discussion. Robert Scoble has his own recommendations for Google and while they’re probably the least that would be acceptable to the majority of people, it doesn’t go far enough I think. It certainly doesn’t have to be this way. Twitter allows companies, bots, and just about every other type of social account and it works quite well in the end. Twitter ran into a similar identity issue in a big way a couple of years back after facing lawsuits and widespread complaints. They managed to muddle through with Verified Accounts. A growing consensus is that Google should allow user-defined accounts as well, with verified identity for those that want or need it. Personally, I’m not sure I see Google coming around with a response fast enough to prevent some damage to services and impacting Google Plus‘s runaway adoption. But in my analysis, it’s most likely to only hurt the commercialization of the service, not regular usage for most for now. Worse, the problem may actually be core to the way Google’s stack is conceived and architected. It may not be easy for them to change course in the short-term without ripples through the way global Google’s services fundamentally operate from a security and identity perspective. It also may not be good for their business model which is almost certainly based on the fact they know who people really are. This issue is one to watch given Google’s pervasiveness. It also has some significant implications for business users of its products, especially now that they seem to be gaining some much needed traction in the social networking wars. For now, I’d recommend that businesses use Google Plus with an eye towards experimentation while the Web giant gets its philosophy and policies around identity sorted out. 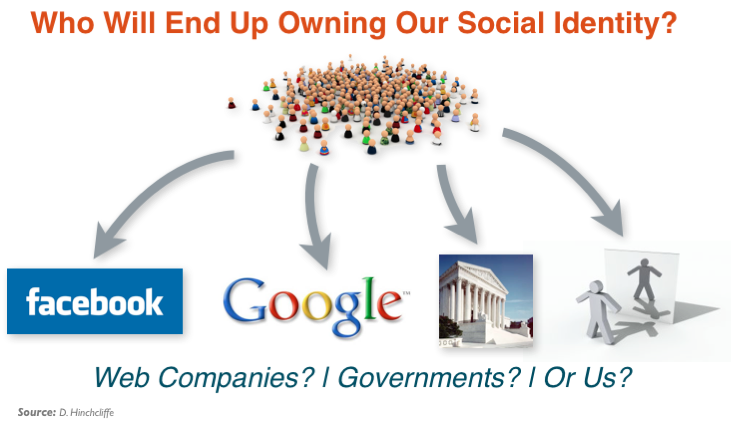 Frankly, the bigger industry issue is social Web identity itself. Users and companies increasingly depend on commercial providers like Facebook, Twitter, and Google to provide everything identity-related, from login access to storage and maintenance of their social graph. This is causing key elements of power and control to start to swing away from the open standards that made the Web so successful and essentially fair. Will the W3C step in and resolve what’s appearing to be an increasingly glaring absence in the Web stack? So far it seems unlikely given the failure of many years of open standard Web identity efforts. The culprit? You have only to look in the mirror. Apathy by users and lack of consensus on the part of Web developers. There’s also a lot at stake financially for those that end up owning a big chunk of Web identity. Consequently, online — and especially social — identity is likely to grow into a full blown brouhaha in the next couple of years as issues, missteps, and abuses inevitably surface. However, we could also decide to put our own house in order before governments step in, the least desirable of all outcomes in most imaginable scenarios. The worst probably being governments owning, issuing, and centrally managing verified Web identity credentials for everyone. Government Bans Chipping Away At Social Media Freedoms? A couple of interesting things happened this week with governments aiming their considerable might at social media. While knee-jerk responses to this space were common enough a few years ago, with the U.S. Marines banning social media access for a while for example, these are now generally understood to be counterproductive and unworkable for a long list of reasons. In another similar situation, the Missouri state government’s new law preventing teachers from using social media to communicate privately with students, the former who just announced that they are fighting back, is another case in point. There are obvious free speech issues with the law despite the good intent on its face to protect students. The real issue is that the law is that violations are almost impossible to detect and enforce, until its too late, and that it ensures teachers, one of the most collaborative and interaction driven professions with far reaching impact, can’t have much of a social media presence of any kind until the implications are sorted out. It also presumably doesn’t prevent teachers from privately communicating with their students in any number of other digital channels. All of this means the law won’t accomplish a whole lot other than sowing confusion and promoting the use of increasingly obsolete methods in an increasingly fast-changing economic and societal landscape. The real issue with both of these laws is that they are 1) essentially short-sighted, 2) exhibit such poor understanding of social media as to be essentially useless, and 3) are therefore unlikely to be meaningfully carried out. Worse, they chip away at the edges by introducing step-by-step, largely ineffective government oversight and control over social media, one of the largest economic, cultural, and societal changes of our time. This will become an even hotter topic as the Middle East’s social media coordinated model for uprising spills out of the developing world. In fact, this has already happened in Britain and there are already cries to ban social media in cases of civil unrest. I should be careful to note here: I’m not by and large suggesting there’s any overarching government scheme to interfere with and control social media. Instead, I’m suggesting we keep a close eye on these developments as social media legislation increasingly (and inevitably) accumulates in bits and pieces on the base of knee-jerk responses to individual situations. This will have a great many unintended and unwanted consequences. The continued growth of laws and regulations in a vital new industry that thrives on inherent openness and trust has the potential to limit it so profoundly that we could lose much of the great promise that social media can provide. While we must find ways that work to protect our citizens, we must also provide them access to one of the most open, free, and powerful means of interacting that has been invented. Let’s push back on unreasonable measures while also proactively being responsible for solving them. It’s up to us to start finding globally acceptable solutions to privacy, security, and misuse in social media and getting them into the hands of those who don’t understand this space well enough yet to govern it. The options for making this happen are something I’ll explore as soon as I can. When Jim Highsmith graciously invited me to give the opening keynote at the inaugural Agile Executive Forum in Salt Lake City this week, I had to really sit down and think about what I’ve been working on the last few years, namely social business, as compared the conference theme, agility and business. While agile methods have had many separate and distinct threads within the business and technical worlds over the last 20 years, one of the most active areas has been in software development. For its part, social business is a much newer phenomenon that’s become a top priority for many business leaders in the last couple of years. So, while I’ll cover the details of my presentation — in which I connected agility and social business as drivers of innovation, in another post — I will attempt to more formally to capture the specific similarities here. In recent years, as agile development has been increasingly borne out as a fundamentally better, more efficient, lower risk, and more cost effective way of doing things, there has been significant and growing effort apply agile lessons to business in general. And, as it turns out, agility and social business, as two major new ways of connecting and organizing people in directed activity, have plenty in common. Perhaps even more importantly, they have key things to learn from each other. I’ve had quite bit of experience with agile methods personally, having led extreme programming project teams and been closely involved in large, distributed SCRUM projects in years past. I’ve seen agile methods work significantly better than classical processes. This is probably why it’s now the most common development process in software that developers identify with in my experience. Consequently, I’m in a position to see some of the connections between business agility and social business, in all their many flavors. The connection isn’t trivial either. 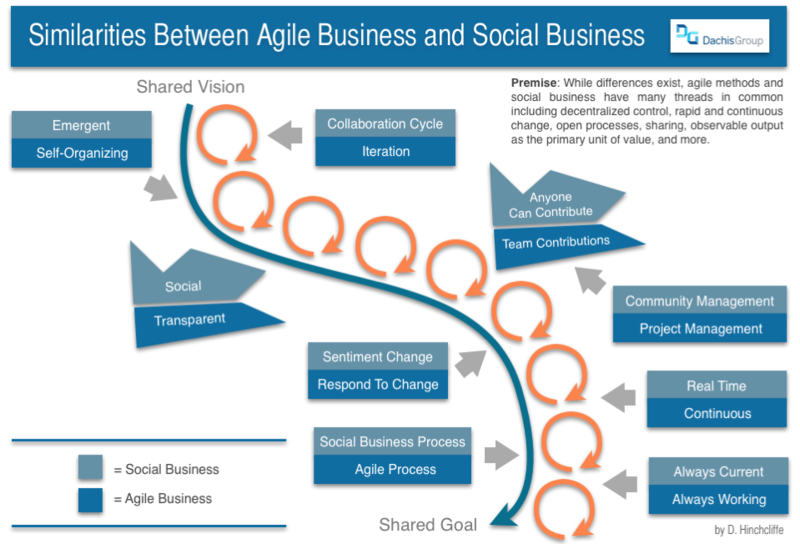 There are hard won lessons learned from agility that social business initiatives could certainly benefit from. Just as there are innovative new approaches to scale, transparency, process, and tooling that social business brings to the table, as extreme and radical as they may appear to agile folks, who are more used to being the harbingers of change. What’s the point of connecting these two approaches? Because they can learn a great deal from each other. Agile methods can be updated and modernized from what social business brings to the table, and social business can apply some maturity and rigor to what it does, as appropriate. This I believe is a fruitful exercise for both disciplines and is one I summarize below. Keeping in mind that some agile process purists are still on the fence about applying the methods more broadly, the focus here is on agile processes of any kind as applied to general people-based business activities. Some processes are more amenable to agility, just as some are more amenable to social business. In general, however, the less collaborative, more rigid, and user-isolated a business activity is, the less applicable either agile or social media methods will be to it. However, if you have a complex, open-ended, and outcome-oriented business process involving many people, especially including those that it most directly affected (typically, the customer, internal or external), then both approaches represent the very best ways that we know of today to deliver successfully on them. Coordination Instead of Control. Both agility and social eschew using centralized hierarchies to achieve control. Instead, as Brad Appleton has long recommended, they both work best with autonomous, adaptive, and accountable actors. The first two are something that applies very much to social business, while the latter is something inherent in any social environment that has a strong identity system (which, unfortunately, not all do.) The lesson here is that emergence (an important and prized aspect of Enterprise 2.0) and self-organization are very similar and are shared as core values in both disciplines. Designing for Change/Loss of Control. This is something in which agile is inherently stronger than nascent social business methods, which are just wrapping their heads around this. Not killing emergence requires the acceptance that external change is a desired constant and should be responded to productively to get the right results with the resources at hand. Ignoring that requirements aren’t what the customers need, that the planned outcome of a business process won’t be very useful, and other denying of reality is anathema to both disciplines, but is more formal and well-defined in agile methods. Social business does recognize that the majority of productive output is on the edge of the network and largely outside of formal control, but other than measuring community sentiment, that’s often as far as it goes in terms of responding to new ground truths. The best results in both approaches are when there are tight feedback loops to all stakeholders and that a planned response to that feedback is the central factor in re-engagement with the project or online community in the next cycle. For additional insight, read Tim Leberecht’s great overview of this issue, titled Openness or How Do You Design For the Loss Of Control. Frequent Work Cycles. Agilists call work cycles iterations. Social business doesn’t have as strong a notion of discrete work cycles because it’s essentially continuous and itself emergent, a more extreme version of agile when you look at collaborative work in social media environments such as crowdsourcing efforts or Social CRM. In either case, the project and/or community must assess and respond to change at the end of each iteration, or do it continuously which is more common in the case of social business processes. Open Contribution. Social business works best when the broadest possible invitation is made for stakeholders to get involved and contribute. Agile processes tend to define valid contributors to a smaller audience, though it’s entirely up to the project and varies widely. Social business realizes that the “anyone can contribute” default stance is one of the most powerful concepts in recent business history (as only those that care about the outcome will get involved, yet that’s almost always many more people than you thought.) Agile methods could learn from the extreme openness and fewer contribution boundaries and barriers in social media. I made the point in my speech that open source software has proven this in the real-world better than any a priori speculation about what works best ever could. Working Results. It’s long been the mantra that agile processes value working software as soon and often as possible at any given time in the project. When the requirements are right and/or the budget runs out, you have the best possible output, ready to use. Social business is not yet so disciplined in its directed outcomes, yet by its very nature is always up-to-date with the latest revisions, contributions, or updates. Continuous Processes. While agile business typically recommends iterations, milestones, review steps, and other processes to happen as often as they provide useful course corrections (typically every few days, or weeks at most), social business is even higher velocity and larger scale. Consider real-time processes that run around the clock globally involving tens of thousands and sometimes a million or more simultaneous contributors. This means the scale and velocity of social business often outpaces agile by two to four orders of magnitude. Social business could learn a lot about continuous in the small (builds, releases, work product iterations, etc) while agile can perhaps learn to scale and go even faster in a way it never could before. This comparison just scratches the surface but is a useful start. I’m happy to be called out on any details anyone feels like I may have gotten wrong. I do believe that agility and social business go hand-in-hand and that we can cross pollinate the two to create far stronger results that either can by themselves today. Put simply, agile business and social business are two sides of the same coin. That may be a controversial statement to some but I believe that as far along as these two disciplines have come in parallel, they will do better with more explicit and effective connection. Our organizations (businesses, organizations, government, etc.) will almost certainly benefit. What do you see as the commonalities and differences between agility and social?